When selecting the cuisine, think of your guests. If you have a mixed gathering, Continental or international cuisine is always the safer bet. But if your guests lean heavily towards a certain ethnic cuisine, it would be better to offer a cuisine with their taste in mind. Or you can add a few Indian or Mediterranean foods along with the popular western one. That would make everyone happy. Our experience is that you can’t go wrong with Middle Eastern food since we live here. But make sure to go easy on the carbs so that don’t fall asleep after lunch. Once you have decided on the cuisine, it’s time to start planning for the food dishes. Start with the main entrée. Choose one or two main entrées. Depending on the entrée, choose two or three complimentary sides for each entrée. If you aren’t offering a main course, you can choose to go with appetizers. With no main entrée, your guests will consume at least 12 pieces of appetizers each. If you’re serving the appetizers before the main entrée, your guests will probably consume 5 pieces each. Eating habits have evolved a lot over the last few decades. Many people are consciously opting for a healthier lifestyle. That’s why you should offer some healthy food options at your event. Also, vegetarian options are good for those who cut out meat from their diet. Beverages are usually not your main focus during food planning, but you need to keep your guests hydrated. Water is essential. Every guest should have easy access to water. If it’s a sit-down dinner, place a large water bottle at every table. Other than water, you should be offering at least two other beverages. If it’s an early event, coffee and fresh juices would be needed. For a late event, guests might be expecting something more aggressive than coffee. But not everyone in the UAE drinks. Keeping this mind, you should offer some other alternative too. The last part of your food serving is dessert. It’s always a good idea to offer three to four kinds of desserts. If you are offering a large variety, opt for smaller portions. Desserts are great for reenergizing the group after a heavy meal. The timing of your events determines the meal type. 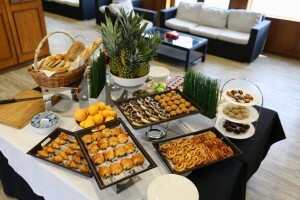 If your event is happening in the morning, offer your guests breakfast. You can choose from Brunch, Lunch, Hi-Tea, and Dinner. If the event stretches for a longer period, you might want to offer two meals instead of one. If that’s so, it’s a good idea not to overdo the food variety. If your event allows it, go creative with your food serving. That can be a great conversation starter and gives your guests the chance to interact with each other. Sharing Platters is an interesting idea. You can also offer ‘Create our own salad or meal stations’. For a mixed gathering, you can create themed food stations offering multiple cuisines. Usually, when you go to a party or an event, you tend to eat more than you usually do (because it’s free?). At home, you might be full with the first serving but at events, second and even third helpings aren’t very uncommon. So, when planning for food, make sure there’s extra. Your guest list comes in handy here. Keep enough for second helpings. There’s nothing more embarrassing than empty food stalls. It’s always best to have more than less. The leftovers can be easily donated to The Food Bank. If you’re offering a lot of variety, offer bite-sized or smaller portions. Your guests would want to sample everything. With bigger portions, they may only take halves. But when you are on a budget and are offering limited food options, you should go for bigger portions. We want to help you serve the best food at your event. 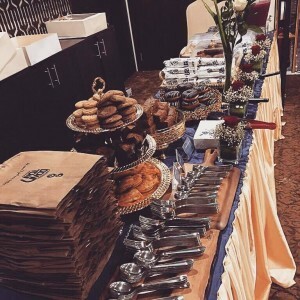 Get in touch with www.fluidmeet.com to choose from the best variety of customized event and meeting spaces with the greatest dinner and lunch menus for your event. Previous PostHow big should the banquet hall be? Is there a golden rule? Next PostVAT on your Workspaces?